Play with Purpose - it's a great way to build relationships, strengthen teams, unify diverse groups, and grow in character. 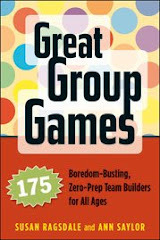 Use this site to preview games from our Great Group Games book, learn more about playing with purpose, and share your favorite games. We love it when readers share games with us! This game was shared by Ashley, a high school student from Newberry, Michigan. Ask a few volunteers to leave the room, and give those volunteers the instructions to make the audience clap. They can do whatever they want; they just have to make the group clap. Separately, you give the audience instructions to copy the actions of the person outside. This includes repeating what they say. You bring in the people from outside one at a time. When the outside volunteer claps, the audience will also clap – thereby declaring the volunteer to be a winner. Authors Ragsdale and Saylor, experienced trainers and youth development leaders, have compiled games that are perfect for classrooms, retreats, workshops, and groups on the go. Each game includes details on timing, supplies, set up, suggested group size, game tips, and reflection questions. Best of all, the games are far from mindless. Games like “Tiny Teach,” “Common Ground,” and “The Winding Road” will really make your group members think. These low-prep activities work for small or large groups and can be done anywhere. You’ll make every moment meaningful and every game great!